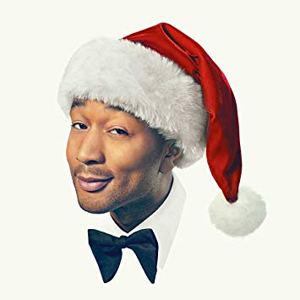 Spin This: "Bring Me Love," "No Place Like Home," "Silver Bells," "By Christmas Eve"
Certainly those that have followed John Legend’s impressive career religiously may have witnessed him touching on virtually every avenue of soul, from AC piano crooning to retro R&B serenading, from mild crossover-ish hip-hop (“Green Light”) to experimental. On his first foray into the holiday music genre, John Legend does a humbling and remarkable thing. He shoots at the hip of golden nostalgia and he remains in character for the entire duration of the album. He’s been down this road before — for instance, the Grammy-winning Roots collaboration of Wake Up!. Legend knows that if you’re gonna make something classic, you got to reach back to the magic of the classics and stay true to form. And he does that with the entirety of A Legendary Christmas, a majestic fourteen track sleigh ride capping off at fifty minutes of easy listening bliss. And it’s a joyful adventure worthy of multiple plays and yearly revisits aided by plenty of throwback jazz circulating through the speakers. “Have Yourself a Merry Little Christmas” gets a swinging Ella swag while the Charlie Brown holiday anthem “Christmas Time is Here” gets an embossed swing update, especially on the gloriously improvised fade. And some of these recreations remain true to their treasured melodies, like Charlie Brown’s bluesy serenade “Please Come Home for Christmas” and Stevie Wonder’s tinsel-donning “What Christmas Means to Me,” where the Motown living legend guest stars on a closing harmonica solo. And there’s “Silver Bells,” a glorious standout with a Jerry Butler-meets-Barry White symphonic reworking. It’s so magical that it feels like a timeless piece of jukebox delight. The only major stumbles on the set are relatively small but strangely obvious. On Chuck Berry’s “Merry Christmas, Baby,” he works up a dazzling Ray Charles-esque vibe thanks to its Rhodes struts and funky horn blasts. But it’s towards the closing seconds where he callously merges it with “Give Love on Christmas Day,” which abandons the prior Big Band sound for something that seems unnecessary. He also pulls off a falsetto on “Purple Snowflakes” that sounds stuffy and congested. Legend is a stellar pianist and a force to be reckoned with. He’s proven it from time to time on now classics like “Ordinary People” and “All of Me.” And he does it with A Legendary Christmas. When you hear him exercising Nat King Cole crooning on “Waiting for Christmas,” you’re reminded of what holiday music sounds like. Thanks to the dynamic duo pairing of Legend with Saadiq, this sleigh ride, one of the finest holiday albums of the 21st century, comes together so wondrously.